Many mosquitos breed in small sources of standing water around the home. Even a small amount of water can provide breeding areas for mosquitos to lay their eggs in. Empty water from things like pool covers, saucers under gardening pots, buckets, recycling bins and garbage cans. Clear your property of unused items like old tires that could collect water. Change water twice a week in things like bird baths, pet bowls, wading pools and livestock watering tanks. Use screens to cover rain barrels. Regularly clean eave troughs to avoid standing water. Do not over water lawns or wash cars in your driveway. The water goes into the catch basins on your street, providing breeding habitat. Check your ponds for larvae, which are easy to spot. Look for small aquatic insects that suspend themselves at the surface of water and wiggle below if you disturb them. Encourage your ponds to reach a natural state of balance by planting native plants. Manually remove mosquito larvae with a small aquarium net. Scoop the wriggling insects at the water’s surface. Drain the water source periodically. Install an aerator or pump that will keep the surface water moving. This makes the pond unsuitable for mosquito egg-laying and unwelcoming to the larvae. Attract mosquito predators like bats, swallows or dragonflies to your yard. If your wetland is natural, or is connected to a natural waterway like a creek or lake, it is illegal to put fish in it. Be sure to contact the proper authorities for advice before introducing fish. Over the past few years, the City of Colwood has received numerous calls regarding mosquitos in and around Colwood Creek. On June 27, 2016, Colwood Council resolved to undertake a pilot project to reduce mosquitos by installing swallow and bat boxes. Swallows and bats are both insectivores who eat thousands of flying insects each day. Their diets consist of insects like beetles, wasps, ants, flies, moths and grasshoppers. While mosquitoes make up about 10% of their diet, Council felt the installation of boxes was worthwhile as a pilot project to measure its effectiveness. 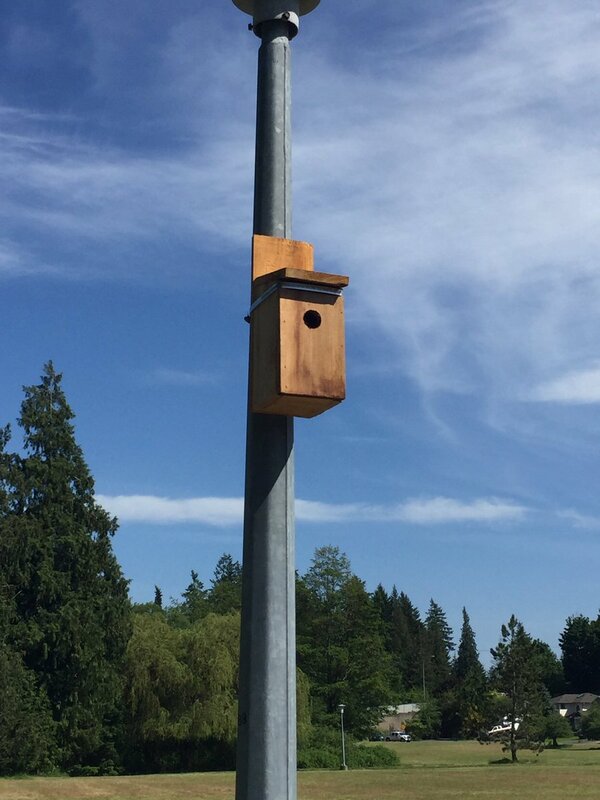 In the spring of 2017, several boxes were installed on lamp posts in Colwood Creek Park for monitoring. This plan has the added benefit of providing habitat for local bat populations. There are 10 known species of bats on Vancouver Island, and all of them face threats from habitat loss, predatation by cats, and disease. If you are bitten or scratched by a bat, seek medical attention to be vaccinated immediately. Find more information about local bat populations at Habitat Acquisition Trust.